Tim Crawford is an internationally renowned thought leader in the areas of IT transformation, innovation, Cloud Computing and Internet of Things (IoT). Tim has served as CIO and other senior IT roles with global organizations such as Konica Minolta/ All Covered, Stanford University, Knight-Ridder, Philips Electronics and National Semiconductor. Tim is a regular keynote speaker at industry conferences and is well published in business and technology publications. Areas of expertise include strategy, applications, services, infrastructure and operations. Tim serves as an advisor to global enterprises, government agencies, venture capital firms and startups across numerous industries on a global scale including airline, financial services and healthcare. Tim’s approach focuses on driving business value through key game-changing strategies. Tim serves on the Board of Directors for Modius and on the Advisory Board for CloudVelox. Tim holds an MBA in International Business with Honors and a Bachelor of Science degree in Computer Information Systems both from Golden Gate University. VCloud News thanks Tim Crawford (from www.avoa.com) for sharing his thoughts here. Below are his latest blogs. For many years, traditional IT thinking has served the IT function well. Companies have prospered from both the technological advances and consequent business improvements. Historically, the conversation typically centered on some form of technology. It could have been about infrastructure (data centers, servers, storage, network) or applications (language, platform, architectures) or both. Today, we are seeing a marked shift in the conversations happening with the CIO. Instead of talking about the latest bell-and-whistle, it is increasingly more apt to involve topics about business enablement and growth. The changes did not happen overnight. For any IT leader, it takes time to evolve the conversation. Not only does the IT leader need to evolve, but so does their team and fellow business leaders. Almost two years ago, I wrote about the evolution of these relationships in Transforming IT Requires a Three-Legged Race. Are you ready to take on tomorrow’s IT? Think again. Let’s get one thing out of the way right up front. The business of IT is very complex and getting increasingly more complex every day. It does not matter whether you are the buyer or the seller; the industry is evolving into a very different and complex beast. How we, as CIOs, have lead IT organizations is very different today from how it was done just 5-10 years ago. In many ways, it is easier to forget what we learned about leading IT and starting over. Of course, the leadership aspects are perennial and will always endure and grow. I wrote a bit about the evolutionary changes for the CIO in more detail with the 5 Tectonic shifts facing today’s CIO. In essence, tomorrow’s CIO is a business leader that also has responsibility for IT. 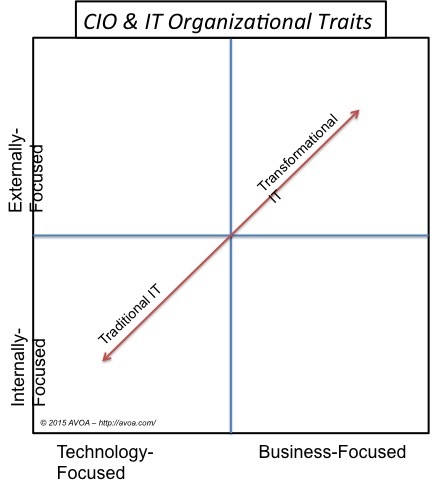 Consider for a moment that the CIO and IT organization sits on a spectrum. Where the CIO and IT sit along the spectrum impacts perspective, delivery of solutions, target, and responsibilities along with a host of other attributes for both the organization and providers alike.